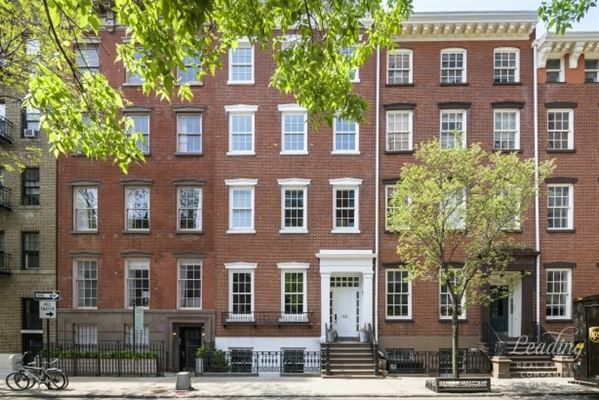 Nestled on a picturesque, tree-lined West Village block, 146 Waverly Place is a newly-renovated, 22+ foot wide, 5-story single-family townhome with approximately 8,016 square feet of meticulously finished interior living space. 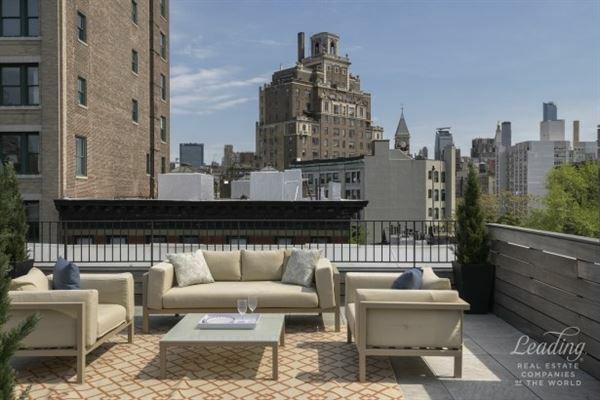 An additional approximately 1,925 square feet is afforded in the planted South garden, terrace, and outstanding roof deck. 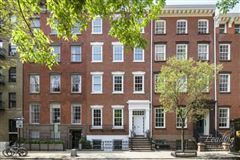 Originally built in Greek Revival style in 1839, 146 Waverly Place was recently gut renovated with the highest level of finishes, and re-calibrated to maximize ceiling heights. Superb home features include an elevator serving all levels from the basement to the top floor, sophisticated AV systems with pre-wiring throughout the home to control climate, lighting, shades and irrigation, radiant-floor heating, a humidification system, and ducted, zoned central air-conditioning. This outstanding residence also affords built-in barbecue grills in both the South garden and sunny roof deck, two full laundry rooms, two fireplaces, and Greige-infused wide-plank oak flooring. 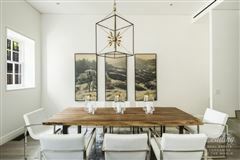 All six levels of the home, including the fully finished basement that is built the entire depth of the lot, are connected by a sophisticated sculptural stairway, as well as the home's elevator. 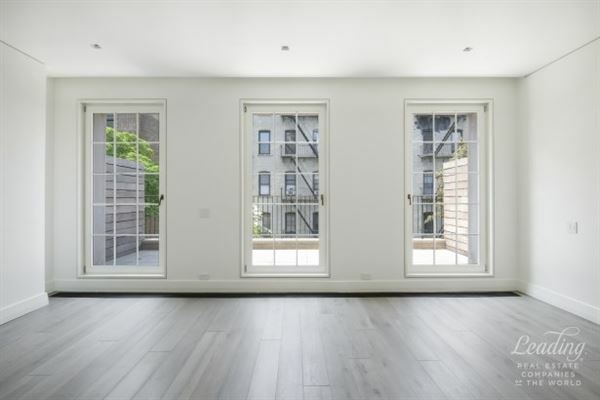 Exceptional sunlight is received throughout, with oversized windows scaling the rear facade, as well as grand front windows that allow for beautiful iconic views of the tree-lined West Village streetscape. Grand room proportions and gracious ceilings make this home ideal for both luxurious everyday living, as well as impressive entertaining. 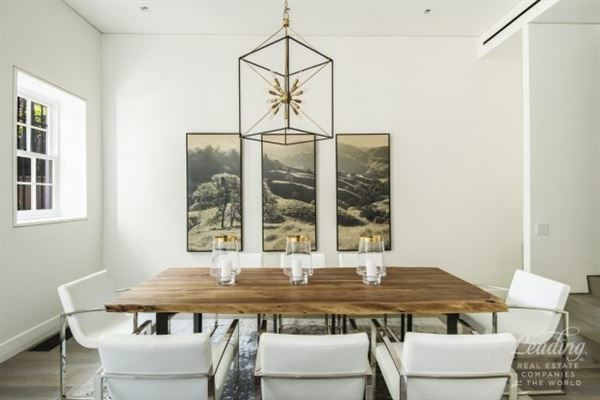 Perfectly positioned on tree-lined Waverly Place and Gay Street, this grand mansion gives immediate access to some of the best dining and entertainment the Village has to offer. 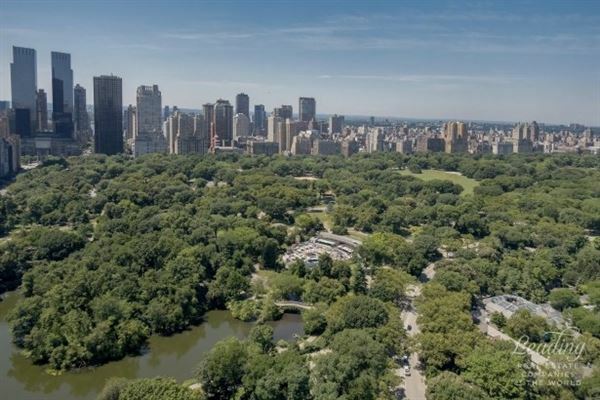 It is also in close proximity to major transportation lines. 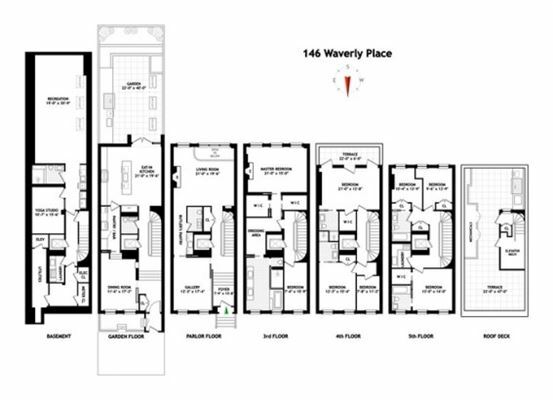 CELLAR: Accessed by either elevator or stairs, and built the entire lot depth, the fully finished, expansive cellar features a tremendous recreation room, with a kitchenette and large wine refrigerator. 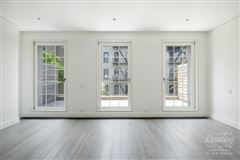 Three skylights receive abundant natural light from the above South garden, and a separate yoga studio provides a tranquil private retreat. A full laundry room, bathroom, ample storage and building mechanicals complete this level. GARDEN FLOOR: Ideal for entertaining, the spectacular Garden Floor is comprised of the home's massive eat-in chef's kitchen and formal dining room. 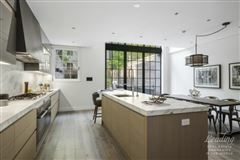 Replete with honed marble countertops, huge center island, and sleek Scavolini cabinetry, the eat-in chef's kitchen is outfitted with top-of-the-line Miele appliances. A sizable pantry/wet bar features an oven, wine cooler, abundant storage, and extends to the elegant formal dining room. 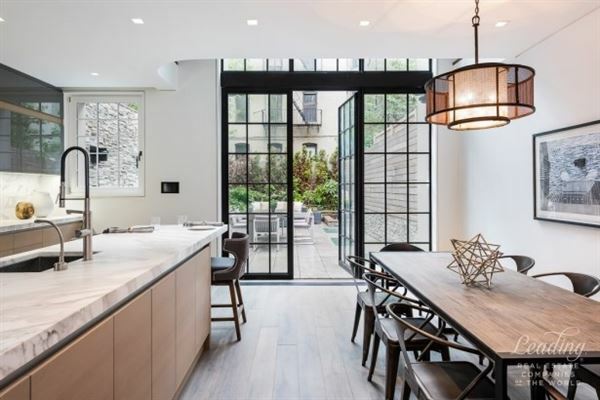 Floor-to-ceiling French doors off the kitchen open to the lushly planted South garden. 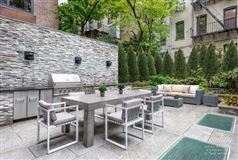 Boasting an alfresco Viking kitchen with a built-in barbecue, the magnificent garden provides wonderful space for both impressive outdoor entertaining and serene private relaxation. A second entrance underneath the stoop provides additional access to this level, and a guests' powder room is discreetly tucked away. PARLOR FLOOR: Ascend the fully restored front stoop and into the grand entry foyer, where a stunning, sleek sliding glass wall opens to the inviting gallery. 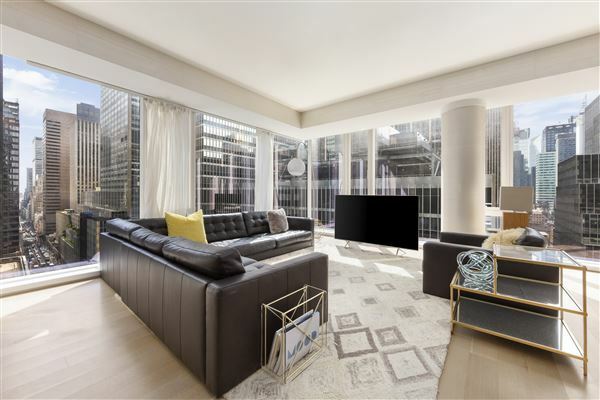 Ideal for showcasing a treasured art collection or sophisticated entertaining, the grand living room on this level boast outstanding sunlight, soaring ceilings and grand proportions. 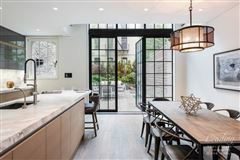 A stunning double-height glass wall spans the living room and floor below, providing beautiful views of the private lower garden and surrounding townhouse gardens. Ideal for entertaining, this level also features a custom wet bar with a Miele wine cooler and dishwasher, a powder room with an illuminated sink, and a sizable coat closet. THIRD FLOOR: The entire Third Floor is dedicated to the sumptuous master suite, comprising a well-appointed bedroom with a luxurious en suite marble bathroom, private study, enormous dressing room and two sizable walk-in closets. The regal rear-facing master bedroom boasts stunning proportions, oversized windows, and is graced with a handsome limestone fireplace. The luxurious master bathroom features a free-standing soaking tub, oversized steam shower, double vanity, and overlooks picturesque, tree-lined Gay Street. 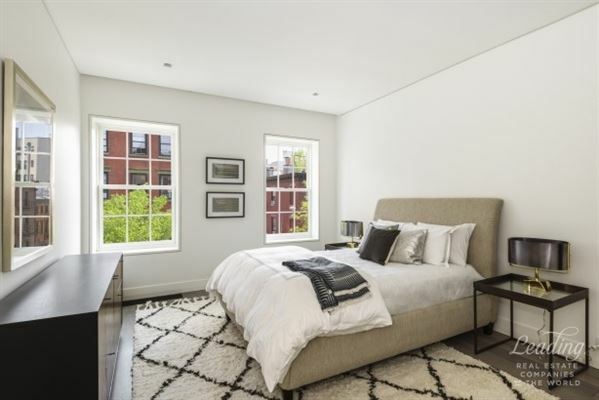 FOURTH FLOOR: This floor comprises three gracious bedrooms, two baths, and a sizable private terrace. Complete with an en-suite bathroom, the rear bedroom boasts wonderful proportions, brilliant sunlight and access to a private South-facing terrace, making this room perfect for flexible use as a media room or den. 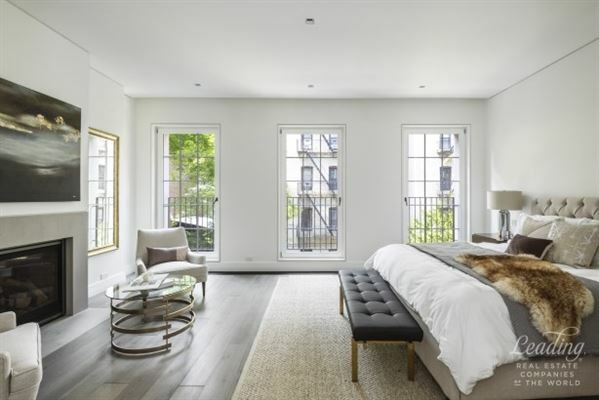 The two front bedrooms enjoy gorgeous treetop views of the quaint Village streetscape below, and the larger bedroom features an en suite marble bath. 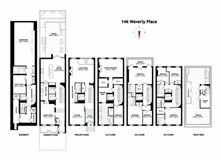 FIFTH FLOOR: The bright, cheerful Fifth Floor features three additional bedrooms, each with abundant closets, two bathrooms, and the home's second laundry room, which is expertly outfitted with an abundance of storage and a sink. 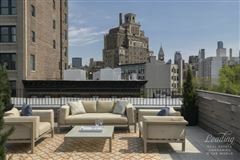 ROOF DECK: The amazing roof deck affords open views of the Village streetscape and Freedom Tower. The expansive, fully finished roof deck is perfect for entertaining, with the home's second alfresco Viking kitchen, which is complete with a built-in grill and refrigerator.